Thanks to our Featured Foodie, Lisa, for this baked breakfast delight. In a large bowl, mix the flour, sugar, baking powder and salt. Mix in the eggs until combined. Stir in the milk, followed by the melted butter, vanilla and nutmeg. Let the batter rest for 30 minutes to an hour. Preheat an oven to 425°. On the stove, melt the butter in a large 10-inch cast-iron or oven-safe skillet over low heat, and use a brush to coat the sides of the pan. Meanwhile, combine ¼ cup of brown sugar with the cinnamon and nutmeg. 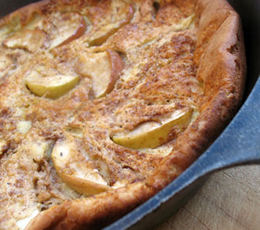 Sprinkle the mixture over the bottom of the skillet and then line the pan with slices of apple. Sprinkle the remaining ¼ cup of brown sugar over the apples. Turn up the heat to medium-high and let the pan sit for a few minutes until the brown sugar starts to bubble. Remove the pan from heat, and gently pour the batter over the apples. Place the pan in the preheated oven and bake for 15 minutes, then reduce the heat to 375° and bake for 10 more minutes or until the pancake is a deep golden brown and a toothpick inserted in the pancake comes out clean. Remove from heat and slide a rubber spatula around the edges to loosen the pancake from the sides. Serve hot or warm. Leftover pancake can be wrapped in aluminum foil and refrigerated for up to 2 days, then reheated at 300° for 15-20 minutes.